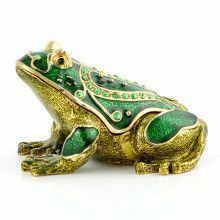 This charming frog keepsake box is adorable and practical. Great for holding those very small items that you can't keep track of, or just great for display. The box features 24-carat gold plating, and array of hand-placed Austrian crystals. 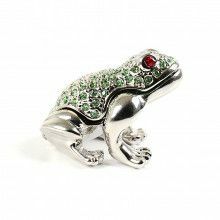 The frog is resting on a green hand-enameled lily pad, and the frog opens and closes with a magnetic clasp. This box comes complete with its own satin-lined gift box.